Reacquistion at Modern Classics in the District. It’s among the most infuriating of times: When you fix one thing and break another. Motorcycle conspicuity, the art of being seen, took up permanent residence in my head when Linda started riding her own bike. All well and good, but I’m never satisfied. 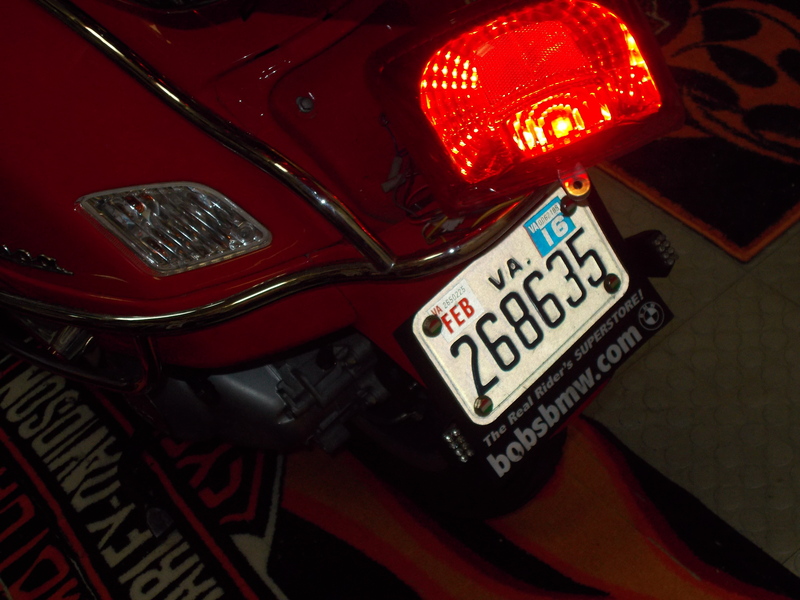 I added a set of bright LED Hyper Lites to augment the Vespa’s brake light last year, and they work pretty well. Hey, the front lights work! But motorcycle riders need every advantage they can get, every modification they can think of, to increase their visibility on the road they share with distracted drivers – the ones who are on cellphones, or texting, or eating, or fiddling with the CD player or GPS unit or yelling at the kids in the back. It’s not an exaggeration; I’ve come close to being hit by these people. They are simply not paying attention. I remember one time aboard Endurance, going to work in the morning and I saw a car start edging out of our building’s driveway as I drew near, kind of a jump-stop, jump-stop, jump-stop and I knew this one wasn’t looking. I lit up all of Endurance’s forward lights, the super-white high beam and the dual auxiliary PIAA 510s, the whole panoply, and I throttled back, ready, and the driver just cruised out into the street, turned her head, saw me, and stopped in the middle of the road. I braked in plenty of time but her mouth was literally hanging open, her eyes wide. She had no idea I was there. That’s because she wasn’t expecting to see me. They never do. And they don’t see what they don’t expect to see, because they’re not looking for it. 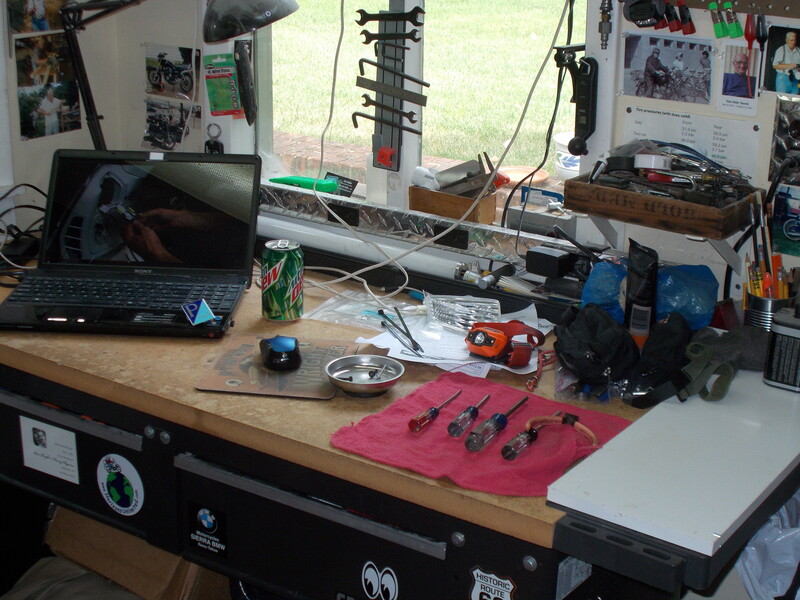 Workshop space, with essential Mountain Dew. They don’t see us. I remember that every time I’m riding as Linda’s wingman, whether we’re on a highway or a country road. I hunt for the errant drivers, the careless ones, the dangerous ones. Against them, we line up motorcycle modifications. I hunt around for upgrades, lights, horns, brightly colored things, to tip the odds in our favor. 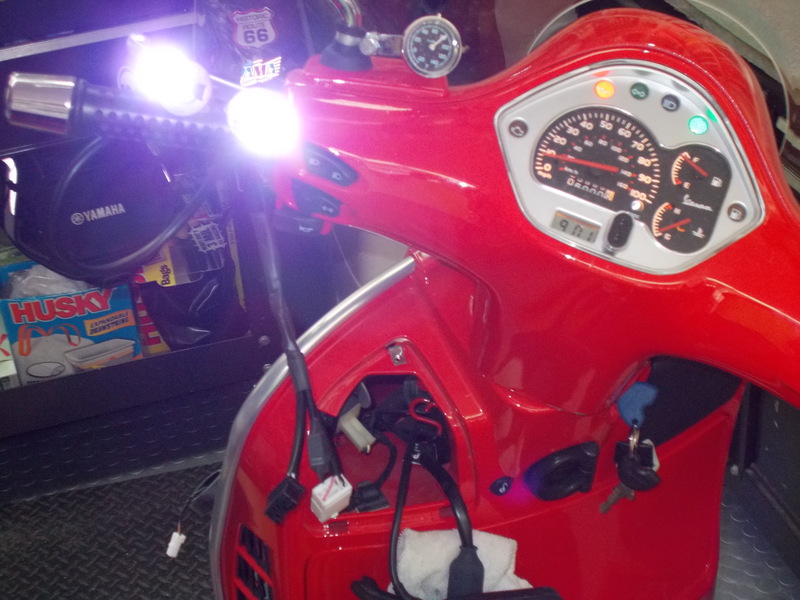 One modification I found for the Vespa was a set of LED front running lights. These are ingenious devices that fit into the same space as the front turn signals. They work as turn signals but also light up the front of the bike, making it harder to ignore. So I got a set from Scooter West, a shop in San Diego, and carefully and patiently installed them on a Saturday morning. I tested them that night and they’re actually pretty good, just what I wanted. Until I tested the brakes and found the Hyper Lites weren’t working. It was one of those son-of-a-bi– moments that left me dumbfounded; I hadn’t touched the brake system. And I hadn’t fiddled with the electrics much at all. The brake light works fine, but the Hyper Lites, which are wired directly into the brake light, stay dark. Other than that, the Vespa is ready for Quebec. 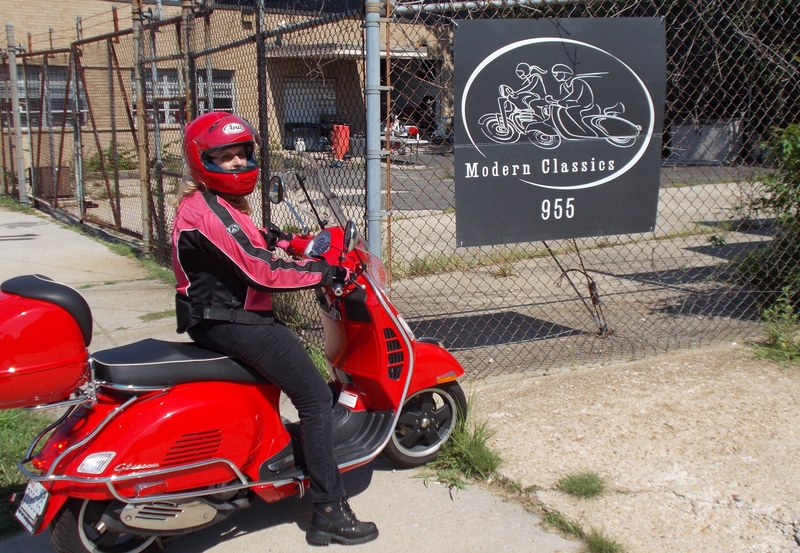 We took her to Modern Classics, an independent scooter shop on V Street NE in the District for a tune-up, engine oil and filter change, and fresh brake fluid. Terra Nova is at the local dealership getting a new clutch basket and cam chain tensioner upgrade so I can sleep at night. I get her back tomorrow. So now I’ll have to spend time with the Vespa. I’ll backtrack what I did during the install of the forward lights and test the Hypers for loose connections and whatnot. Solving electrical problems can be infuriating, but with luck I can fix it. Without breaking something else. That axiom about fix something and break something else applies to more than just motorcycles! Thanks for the reminder to be aware of motorcyclists and to be a better and less distracted driver in any situation!